How do spiders walk straight up - even upside down - on any kind of surface? Scientists from Germany and Switzerland used a scanning electron microscope to find out how they do it - and how humans might make sticky things stickier. 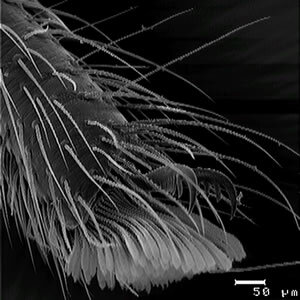 This is the first time anyone has actually measured how spiders stick to surfaces; a scanning electron microscope was used to make images of the foot of the spider (see below). Spiders have over 600,000 tiny hairs called setules on the bottom of their feet. 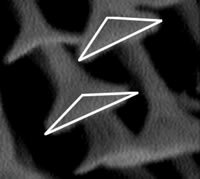 The secret of spider stickiness (or arachnid adhesion) is that the molecules of the flexible, triangular contact tips of the hairs (see below) are set down so close to the molecules of the surface that van der Waals forces come into play. The van der Waals force is an electrostatic force that acts between two molecules that are very close - within one nanometer. The adhesive force of each setule is tiny - but the 600,000 setules generate a force sufficient to hold 170 spiders in place. And, most importantly, it works with any surface, smooth or rough - even wet surfaces. The spider is capable of movement because it releases the setules a few at a time, peeling the foot off the surface. In William Gibson's 1999 novel All Tomorrow's Parties, urban stores had wall coverings that were self-cleaning. Graffitti seldom lasted more than a few minutes. Naturally, this created the need for smart tags that were so sticky that even self-cleaning walls couldn't take them off.